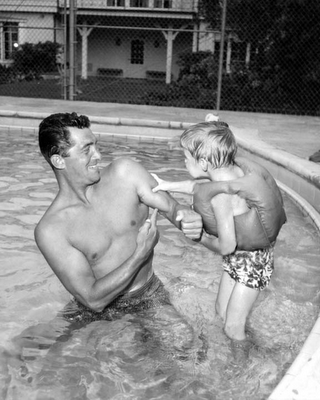 Dino and Dino Jr. . Wallpaper and background images in the Dean Martin club. This Dean Martin photo contains 온수 욕조, 체인 링크 울타리, chainlink 울타리, 욕조, 목욕 욕조, 목욕, and 욕조 목욕. There might also be 목욕하는 사람, 목욕, 큰 덩어리, 한 조각, neonate, newborn, newborn infant, and newborn baby.